HAVING previously stated his belief that his side would beat the drop, Donegal Celtic boss Stephen Hatfield now admits time is running out for the Wee Hoops to save their season. With just 10 games remaining, DC face a crucial relegation clash with Portstewart, who are also bottom of the Premier Intermediate standings on 15 points. Newington missed the chance to move away from the foot of the table on Tuesday night when they were thumped 5-2 by Moyola, meaning they too remain stranded on 15 points. However, Portstewart have two games in hand over the North Belfast side and one game in hand over DC so Hatfield knows his side need to start grinding out results and fast. “There are 10 games left and to be fair, we probably need at least four wins to guarantee our place in the league,” said Hatfield. “That’s the conversation we are having to have now as opposed to any bigger aspirations. It isn’t a nice place to be. Just six points separate the bottom six teams in the league, but DC’s last defeat helped ease the relegation fears of their West Belfast rivals, Sport and Leisure Swifts. 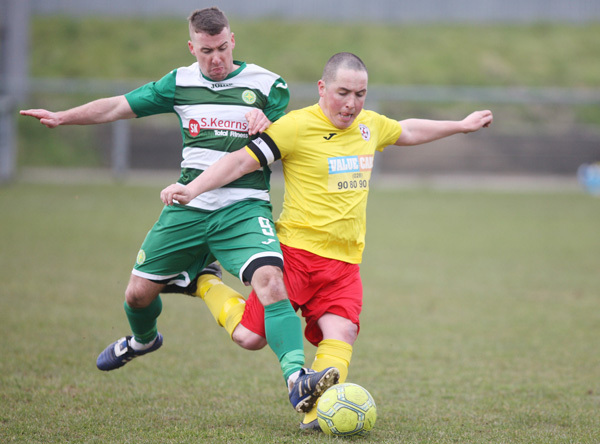 In a tempestuous affair, both Sport and Leisure boss Packie McAllister and DC coach Graeme Steenson were sent off after clashing before the break with the Swifts winning 2-1 at Donegal Celtic Park to move clear of the relegation zone. Hatfield admitted that the unsavoury clashes overshadowed the game, but he doesn’t expect there to be any further fallout from the tie. “It was allowed to escalate and it almost developed into a full-scale brawl,” reflected Hatfield. “Unfortunately, it took away from the event. “I don’t think either team have reached the standards they would have hoped for this season, ourselves in particular. We have been very disappointing. It wasn’t the football people were talking about last week. However, Hatfield is still fuming from a contentious penalty awarded to Barry Johnston in the first half which helped set the tone for a disappointing afternoon for the home side. “There is no getting away from it, it was a very disappointing result,” said Hatfield. “A really bad penalty decision went against us and we went in 1-0 down at the break. It was a shocking decision – I was lost for words when it was given. “Barry Johnston seemed to go over. It doesn’t look as though our defender has gone near him. While Kevin Farrelly and Paul Ryan are nearing a return to full fitness, DC will without the suspended Niall Derry and Karl Rossborough for Saturday’s clash. Immaculata, meanwhile, face a break-or-break Intermediate Cup tie against Tobermore (The Cage, 1.30pm) with manager Tony Heagney admitting their season hinges on their last remaining cup competition. “Our league form has been the worst it has ever been to be honest,” said Heagney. “Everything is now aimed towards this big game on Saturday – this is the last cup competition we are in. This is our season now. “Saturday is vital for us. After beating Banbridge (5-3) in the last round, all we wanted was a home draw because it goes to neutral grounds. We are very happy we are at home. “Our home form, unfortunately, hasn’t been as good as it usually is so we need to lift it. It will be a tough game, but I’ll make sure the boys are ready it. Regardless of how The Mac fare this Saturday, they are going to face a gruelling league run-in. Despite the fact that NAFL Premier Division leaders East Belfast have played 20 games, Immaculata, in stark contrast, have only played 10 league games. “It is going to be a hard run-in and the weather hasn’t helped either,” said Heagney. “All sports suffered last weekend. It is hard because a lot of teams we play against don’t have lights. It is hard to get the games in during the week. “I don’t know if the league is going to be extended this year – we have lost four Saturday games because of the weather. Apart from full-back Gavin Logan, who is suspended, Heagney added that he has full panel to choose from for Saturday’s cup tie.